Reverend Oliver Eugene “Gene” Murphree, along with his wife, Erline, and three children, Cindy, Cecelia, and Sandra, served Aldersgate from 1968 to 1970. Reverend Murphree answered the call to preach in 1956 at the age of 26 years old. He served the Lord until his death in 1996. Once the Murphree family left Aldersgate, they were transferred to West End, Andalusia, which, coincidentally, was the location that our incoming pastor, Reverend David White, was leaving. Tragedy followed the Murphree family. Erline, while going to college to become a teacher (her lifelong dream), was diagnosed with cancer and lost her life in 1978. Then in 1986, their oldest daughter, Cindy, was killed in a car accident. On December 9, 1996 Reverend Murphree lost his battle with pancreatic cancer.Reverend Murphree had six grandchildren. Reverend Murphree loved the children of our church and showed that love in many ways. He especially loved to serve Kool-Aid and cookies to the Vacation Bible School students.Rumor has it that he never quite got the Kool-Aid sweet enough! Reverend Murphree was very territorial about his serving the children their snacks, and those who tried to assist or take over the responsibility were kindly told that their assistance was not needed. He and his wife made the angel wings for our Christmas pageants, (which are still a part of our costumes today) and helped the children practice for the Christmas program each year. The Murphree family closeto the McCaskill family. He and Jack McCaskill shared the love of fishing. Reverend Murphree married Donnie and Jackie Nicholson and baptized Steve Spinks. I wish to thank Donna Ging for these memory of the Murphree family and assistance in researching their history. 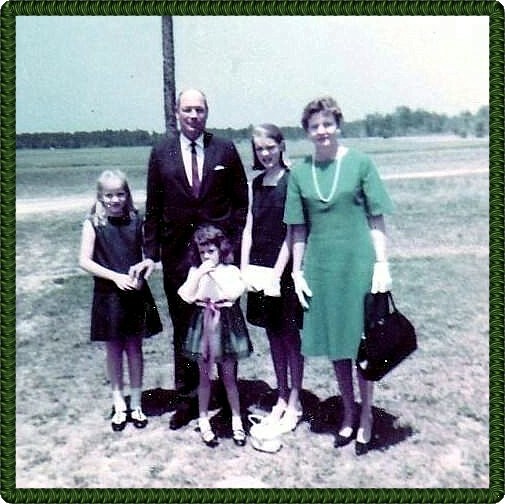 My own memories of the Murphree family were mainly of Cindy, but I remember all three of the Murphree girls having blond hair.I remember Reverend Murphree as a tall man. This might be because I was just a kid, but I remember thinking I was looking up very high! I remember going to dances at Molino Elementary School and Cindy being a part of the group that also included Jackie Milstid and Becky Richards (Jeannie’s younger sister) and others of similar age. Jeannie Richards Nowlin was lead singer for the band named Butterscotch Windowpane!